Luke Bird is a book designer and art director specializing in literary fiction and non-fiction, typography and limited edition book packaging. 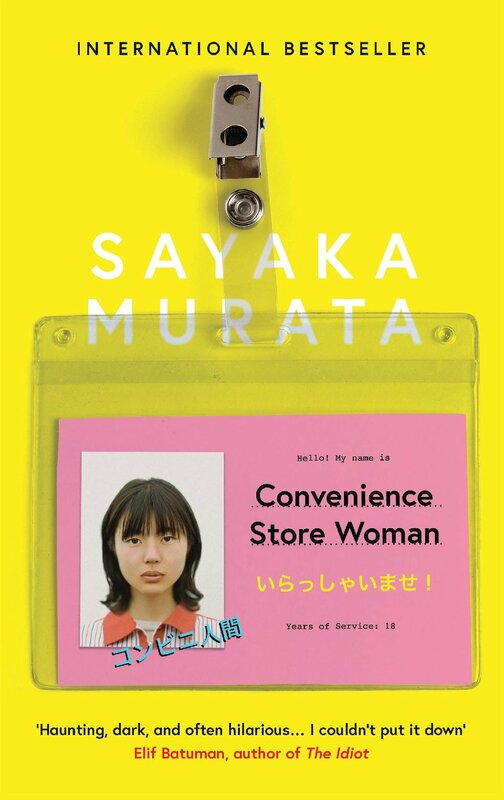 Here he explains his process for creating the sublime cover for Convenience Store Woman. I found that the book had perhaps the most profound effect on me of anything I had read that year. It was every bit as charming as I had hoped, but the undercurrent of unease created a tension which stuck with you for some time after reading. I felt it was important that the cover should look confident and striking, and ‘of itself’. It’s a unique piece of writing. Anything which felt too derivative would fail as a representation of the novel. I started by looking at imagery of Japanese convenience stores, and of the people that might work in them. My first visuals centered on some mundane-looking stores in Japanese towns, and on Keiko as a product of the store. Originally I felt that hiding her face behind a price flash sticker would feel brave and reference both her charm and her awkwardness. On reflection, though, it was felt that these visuals were not impactful enough for what was already an international bestseller in other markets, and that hiding Keiko wouldn’t be true to the deeply human story. Subsequently I spent hours happily lost in Japanese packaging design, which is almost always brightly coloured and replete with slogans. If I could bring some of that energy across in the cover, and somehow combine it with a portrait of Keiko (this felt important) then I felt confident we’d end up with something striking. I noticed that Japanese convenience store employees almost always have name badges (as they often do in other countries, too). I also liked the idea of something which feels very ‘everyday’ and almost mundane (the name tag) in an unusual setting (on a book cover), as that felt right for the story. I added a photo-booth portrait, made sure part of a convenience store worker’s uniform was just visible, and added some Japanese slogans and words like “Irrashaimasé! !” (the welcoming slogan directed at any customer who entered the store), which I hoped would make it feel a little more authentic. I didn’t want the type to fight with the elements on the cover or the vivid colour palette, so I chose something clean and simple which I felt should feel familiar. Getting the bottom of the title to sit behind the name tag was a late addition to the concept, but something which I hope adds a little more depth to what could have been quite a ‘flat’ cover, on the surface. The last challenge was making sure that we had the right portrait of Keiko. In truth this took some time, but I hope that our final character has an air of innocence and naivety, but a brightness which draws you in. I hope we’ve ended up with a cover that answers the brief. I like to think it looks unusual, off-beat and colourful, yet I hope parts of it also feel somewhat measured and conventional. A little like a Japanese convenience store!